The book isn't going ahead. Thank you to everyone who has supported me, the Guild, my local writers group, everyone.... but Blurb, the company who was supposed to be printing the books is frankly being pathetic. I'm too young by a year to use it as I can't use paypal and am not American. I've spent years looking for a way to publish my book the way I wanted, and if it's not going to be perfect, it' not going to happen...I'm not selling my soul to a big money hoarding publishing house and I'm not going straight to e-book, so Dead Night is... well, dead. Of course I'm going to keep writing. I have to or else I'd go insane. Don't expect a lot on the blog for a while though, I'm going to be working on other things, like my poetry and flash fiction. The Guild will go on for new adventures, they just won't be published yet, and of course Alyss and the Resistance of Cai-Terra have a future too. As I said, I can't stop writing. Maybe one day things will turn around, and we can perhaps try again next year or something. Clearly regardless of the actual content of my work, the company dissagrees with me, and will soon be receiving a very strongly worded letter. Sorry to anybody who actually wanted to read it. 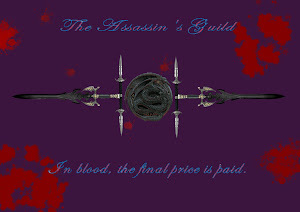 And thank you again, especially to the original Guild.